This crisp is so good! It is nice to take advantage of summer harvests and use fresh berries instead of frozen. The flavors compliment each other nicely and it doesn’t take all day to put this one together. Try it, you’re whole family will be glad you did. 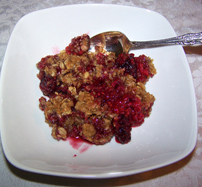 In a large bowl, combine apples, sugar, berries, cinnamon, lemon zest & lemon peel, stir gently to avoid breaking berries. Place in a 13 x 9 inch baking dish sprayed with cooking spray. Set aside. For topping combine all ingredients until it resembles coarse crumbs. Place on top of berry mixture making sure berries are covered evenly. Place into preheated oven and cook for 35 -45 minutes. Cool on cooling rack for at least 20 minutes. Serve with ice cream if desired.